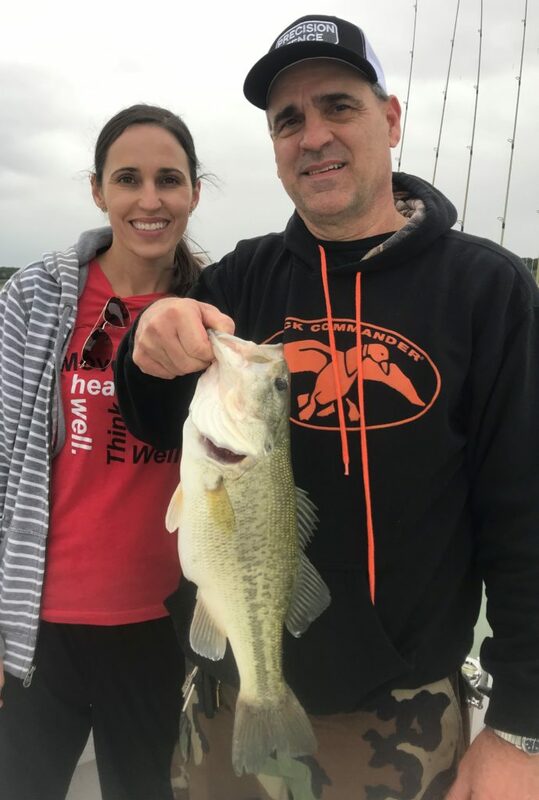 WHO I FISHED WITH: On March 30th, I fished with Jennifer Ivicic and her dad, Tim Prcin. This was a rescheduled trip (due to foul weather on our originally chosen date) and was a Christmas gift from Jennifer to her dad. Jennifer has been with the Killeen Independent School District for 12 years, the last 3 of which she has served as a physical education teacher at Cavazos Middle School in Nolanville. Tim has been an employee at Dealer’s Electric for 40 years. Jennifer’s husband owns and operates a local small business in Holland, TX, – Precision Fence – with four other employees. Jennifer grew up fishing with her dad and had some fond memories of fishing in the Colorado River from the Smith Ranch near the old Lemon’s Fishing Camp, back when her grandparents owned land there. She handled a spinning rod with authority and both she and her dad were willingly coached to success. 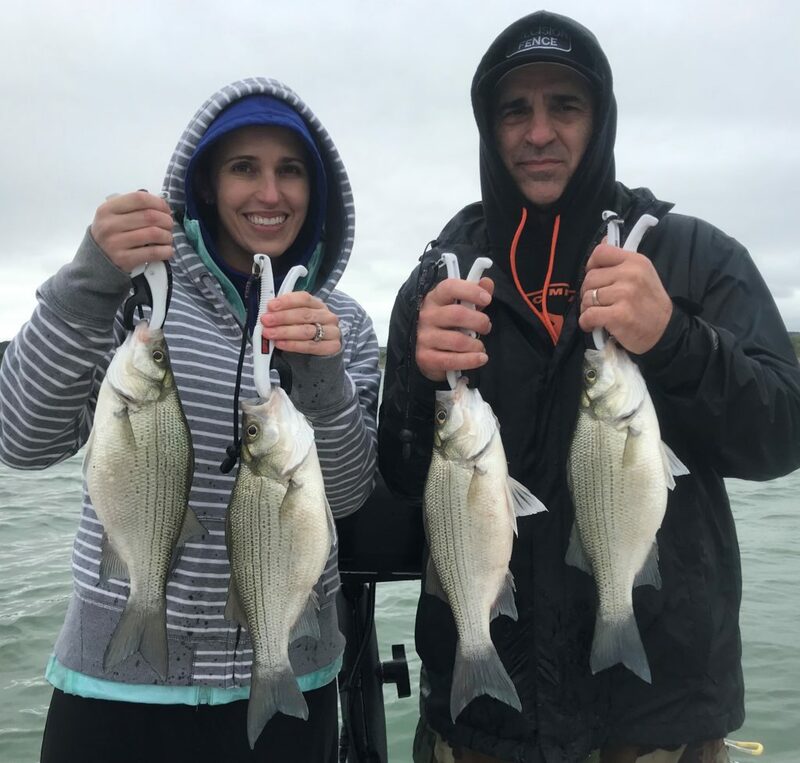 PHOTO CAPTION: Jennifer Ivicic and her dad, Tim Prcin hold 14 to 15 inch long white bass taken on bladebaits thrown shallow during a pre-frontal feeding spree on Stillhouse this morning. Note Jennifer’s clothing as of 10:30 am versus her clothing shown in the photo below around 8:15 am. The front cooled all of Central Texas down by about 9 degrees in a matter of minutes! PHOTO CAPTION: Tim Prcin took this 3.25 pound largemouth bass up in shallow water as we cast bladebaits to shallow white bass feeding aggressively on shad before a big cold front’s arrival. HOW WE FISHED: This morning’s trip consisted of two distinct episodes of pre-frontal feeding by white bass herding shad in shallow water. The first episode took place right at (obscured) sunrise. This low light feed happened as calm conditions changed to a rippled surface as a wave of energy pushed through like a “mini-front” about 2 hours in advance of the inbound cold front. When the wind began, the surface rippled, the clouds thickened and nature came alive. Shad were swimming panicked, white bass were chasing them to the surface, multiple species of birds were feeding from above, and the fishing was fast and furious in under 10 feet of water throwing opaque Cicada bladebaits in the 3/8 oz. size which were a good match for the threadfin shad being fed upon. This feed lasted about 70 minutes and produced exactly 49 white bass and 1 largemouth. When that wave of weather passed, the skies brightened, the winds calmed, and nature settled back down. There was no fish or bird activity again until about 9:15, when the skies began to go grey and cloudy once again with the clouds moving in from the NW. We fished 3 locations under the bright skies and had just begun to fish a fourth when I spotted individual white bass occasionally boiling on shad about 150 yards from where we had encountered them earlier. We moved to this area via trolling motor so as not to spook bait or gamefish, and I Spot Locked us in 8 feet of water, casting up shallower. We watched the assault start in earnest, build to a peak as the front came in, and then soften as the rain and cold began to descend on the area. We got another hour’s worth of pure catching in during this second episode, and added 42 white bass to our tally. The average fish in this school was nearly twice the size of the average fish we encountered in our first episode. Again, the opaque Cicada bladebaits in the 3/8 oz. size were a good match for the threadfin shad being fed upon, although one jumbo white bass regurgitated a 3.75″ gizzard shad, as well. I was about to jockey us into another casting position so as to access a new group of fish that hadn’t been cast over when Tim and Jennifer agreed the additional fish we might catch (as the bite was definitely tapering off) was not worth the additional discomfort which the wind-driven mist and cooling winds were bringing. So, we called it done at 92 fish as the bite was getting soft. OBSERVATIONS: This was a “textbook” example of pre-frontal fishing if there ever was one. Fish in the 1, 2, 3, and 4 year classes were present in these two sprees. Sky Conditions: 100% grey cloud cover through 8:20, then clearing until around 9:15, then clouding again in advance of the front with light, brief precipitation.